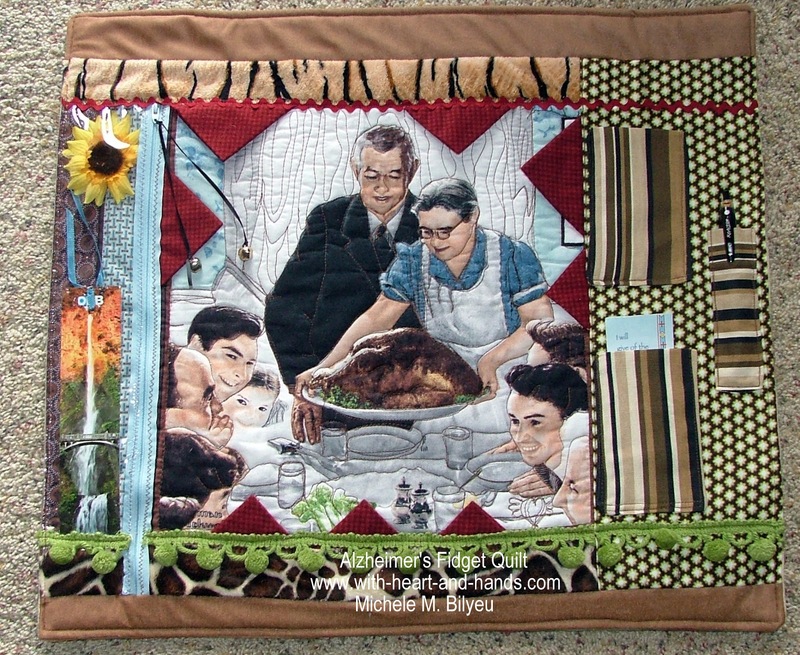 In honor of Martin Luther King Day on January 15th and in honor and memory of my father who shared his birth date, I always spend Martin Luther King's "Be of Service Day" creating quilts, blankets, or other items for those in need. 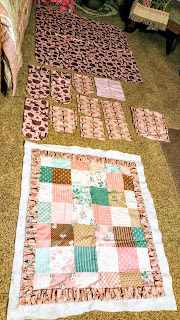 Some years, I sew at home on the 15th and donate my quilts or blankets to local organizations and other years I return to my community quilting roots and join in with a larger group on the preceding Saturday that is making and donating to a multitude of organizations within my community here in Salem, Oregon. I belonged to my local quilt guild for many, many years and made and donated both quilts and pillowcases for a variety of groups as well as Salem Health (our hospital.) 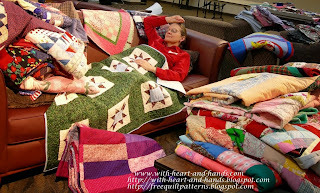 I also sewed with a number of quilters at many different churches or other settings over my years here in Salem, Oregon. Do a little online research in your area and find a group in your community or donate to any of your nearest hospitals. 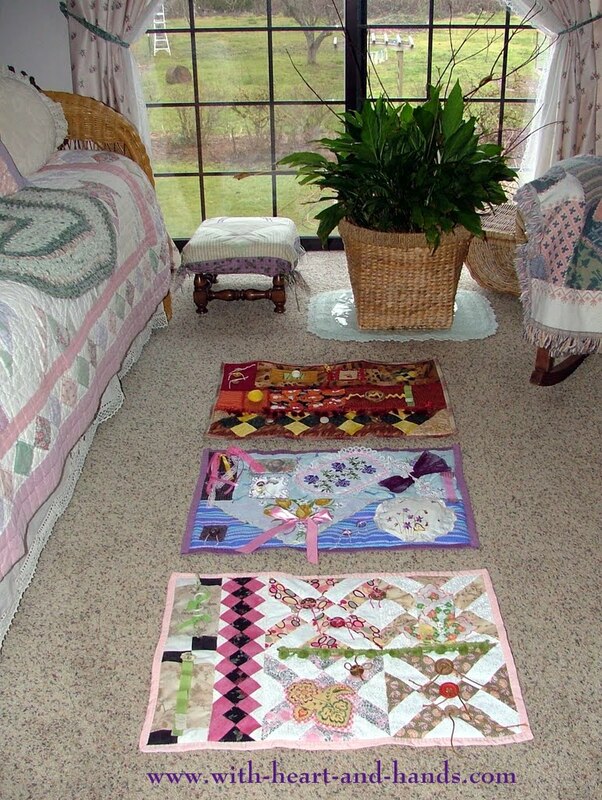 Most accept quilts for Neo-Natal units, Cancer Care patients (for covering up during chemo), or for hospice programs where every family is given a remembrance quilt of some kind to bring home with, for, or in memory of their loved one. 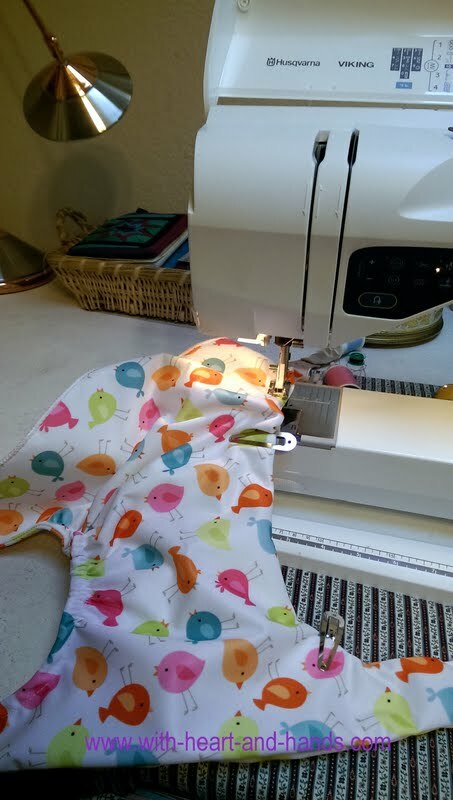 and baby flannel made into receiving blankets, burp pads, wash cloths, and even this one in the process of leftover flannel becoming the ruffled edging and backing of a simply pieced baby quilt. I like to use everything I have for, and in, as many ways as I can. 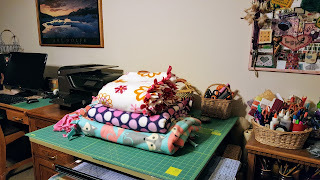 I hope to dig through my fabric and project storage for quilt tops that I have made over the past years and not yet donated to a group and at least get them labeled and into bags to donate. I also go through my collected fabrics and donate what I can to others who will make more prompt use of my own collected fabrics I originally scrounged as leftovers from others, to re-purpose to a new lineage of others in the re-purposing continuum of charitable sharing and giving. 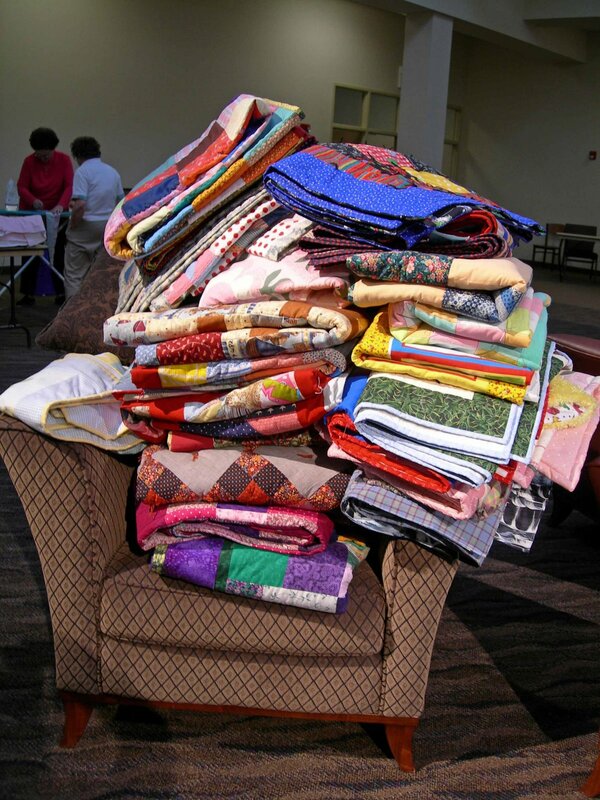 And remember if your scraps are too small to use, many communities have programs, often as part of local mission thrift shops as ours does, that accept used clothing or fabric scraps as 'bale'. Here in Salem, Oregon we actually have donation drop boxes for used clothing or fabric and what can not be used or sold in thrift stores is processed by at least one local group the thrift shop that is part of the Union Gospel Mission as this no longer usable clothing or tiny pieces of fabric or even batting as 'bale'. These fabrics are quite literally recycled and made into other things by factories in the U.S. or abroad and local charitable services make a small amount of money in the process of collecting, storing, and processing all of these hand me down fabrics or clothing for their own use in helping the community members in need. 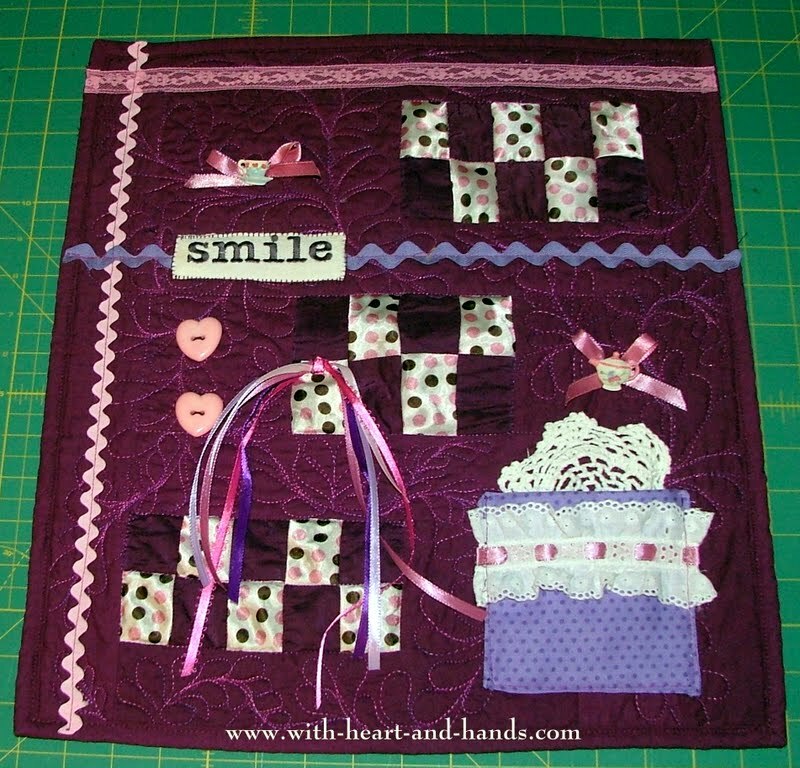 And often you don't even need to remove buttons or zippers as they can be packaged and sold in the thrift shop. 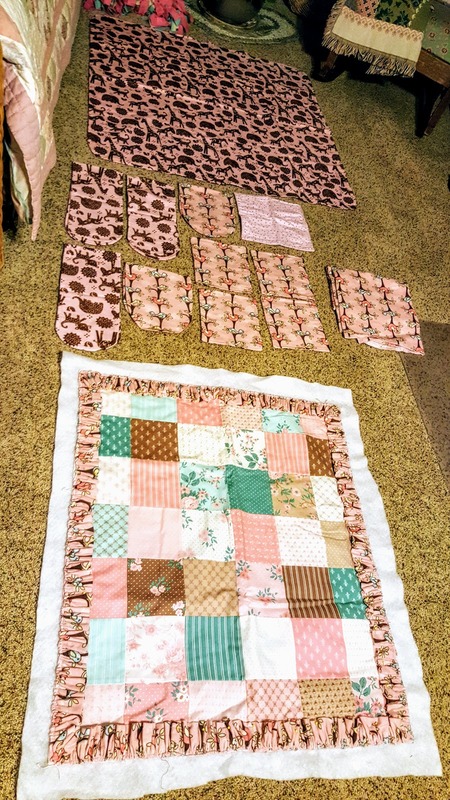 But if you sew clothing or even Alzheimer's Fidget Quilts (shown above and below) remove and save those practical items for your own use in keeping minds and hands busy in these fun little tactile table or lap quilts) before they are donated as reprocessing waste by larger scale recycling factories abroad. 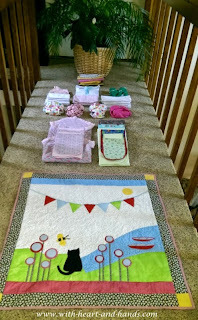 The little quilt above used all donated materials..a leftover pillow or quilt panel, zippers, trim, rickrack, a free bookmark or two, and even a fake flower someone got rid of! 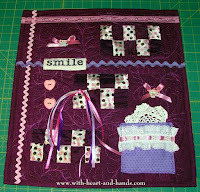 Make, Use, Reuse...Make a Difference! China, for example, finds our American recycling so 'dirty' that they have now refused to accept a lot of previous recycling from out country. And believe me it is very dirty. (People toss horrible things like dirty disposable diapers into recycling bins instead of their own garbage!) Another reason to use cloth diapers and PUL diaper covers..another project of mine and what my own children use for their children. 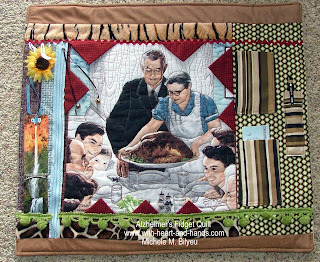 Use and reuse instead of adding to the horrific waste in our country. 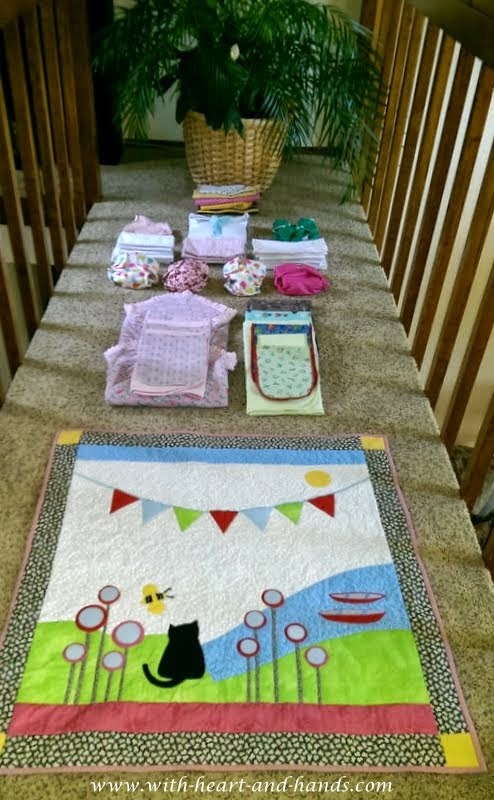 Or make simple baby 'busy' quilts using the same principles as in the Making of Alzheimer's Fidget Quilts! 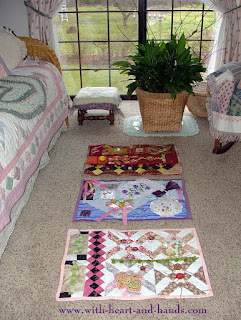 These were made with things from a 'free table'. 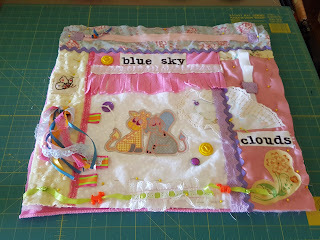 Leftover pieces from others of embroidery, ribbon, buttons, fleece strips, lace, etc. We can both be of service and make a difference in this world of ours and the way we all live in it! 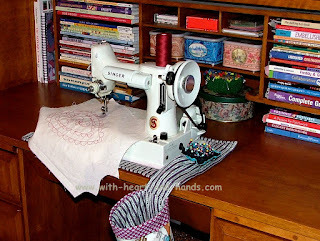 Reduce, reuse, remake, recycle! Because almost everything that I make uses scraps, leftovers, or re-purposed fabrics, it seems especially fitting that I move things along as quickly as possible so they can be used and loved or earn money for various causes as quickly as possible! 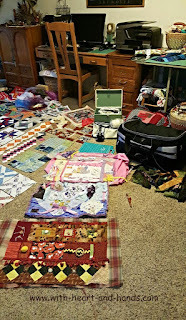 It's all part of my roots of both sewing and quilting and never fails to lift me up to doing good in the world. 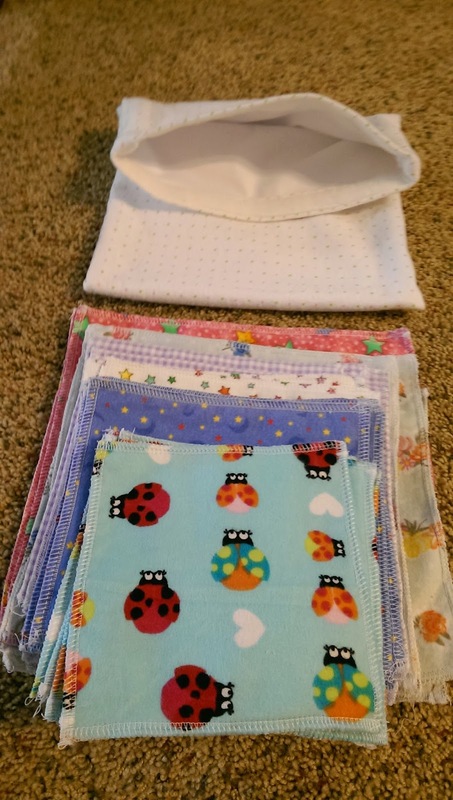 You can make them and you can give them away.....but you can only hope they can feel the love in each and every one of these! Make a difference and be of service in your own life and community! This federal holiday was first observed in 1986. In 1994, Congress passed the King Holiday and Service Act, designating the Martin Luther King Jr. Federal Holiday as a national day of service and charged the Corporation for National and Community Service with leading this effort. What a great tradition to have to celebrate your father and a great leader in our country! You are so sweet and generous. We have a new Goodwill that sells things by the pound opening, so will have to see if they have things like "bale". That is so disgusting that people throw dirty diapers in places that are meant to help people.